If you’re taking on Assassin’s Creed Odyssey and a Twitch Prime member, take advantage of some free loot between October 2nd to December 4th. In celebration of the release of the action packed Assassin’s Creed Odyssey Twitch is giving Prime members some free in-game items in the Aegean Pirate Pack. 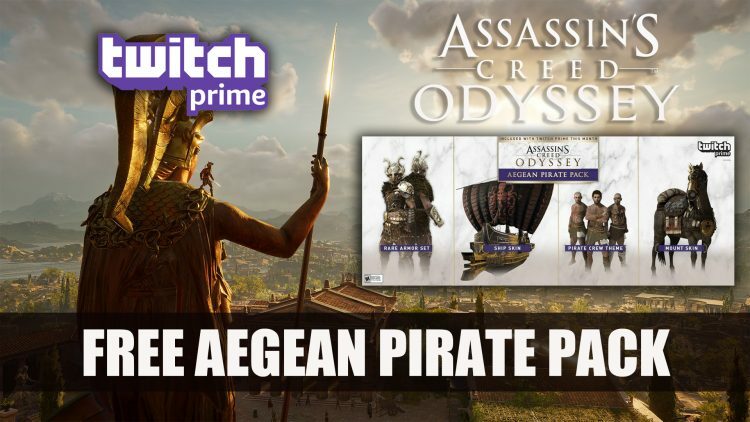 To gain access to the Aegean Pirate Pack you will need to visit the Twitch Prime page to claim the Assassin’s Creed Odyssey Aegean Pirate Pack located at the end of the page. Then link your Twitch Prime and Ubisoft accounts by clicking the link to the Ubisoft website. Once you log into your Assassin’s Creed Odyssey on your platform you will have the pack. Assassin’s Creed Odyssey will releases for PS4, Xbox One, and PC on October 5th, with two days of early access if you pre-order one of the special editions. Don’t miss out on Assassin’s Creed Odyssey pre-order editions as there are some extras including season pass and bonus missions. Read more news about this game in Assassin’s Creed Odyssey Releases Epic Launch Trailer and Assassin’s Creed Odyssey Cloud Version To Launch In Japan. If want to see some Assassin’s Creed Odyssey check out our Fextralife Twitch channel as we are streaming the game this week.